Sorry, this is a bit of a long rambling post, prompted by the fact that I love picking my baby up from nursery to see her smiling, happy and content and I realise how lucky I am with my nursery. Being on maternity leave is fab isn't it? Rolling out of bed (after having little sleep the night before to be fair), feeding bubs, eventually getting dressed before popping off to meet your Mummy friends for coffee and cake....But there comes a time for many of us when that lovely period comes to an end, reality bites and we have to consider going back to work.When my no1 son was 9 months old, I went back to my full-time job. Given that my full-time job meant commuting a minimum of 4 ½ hours daily (9 hours if I had to go to Derby), this meant we had to rely heavily on my lovely in-laws who used to look after him from Sunday night until Wednesday. It also meant that I didn't see my little man for 3 days so needless to say it wasn't that long until mothers guilt kicked in and I quit.While still working full-time, on the days I spent working from home, no1 son went to nursery. It happened to be the nursery closest to us, which I liked from the moment I walked through the door because it had an open plan layout, so you could instantly see all the children at any one time.Seven years on and all my children have been to the same nursery, currently no1 daughter and the baby are there at the same time. I still love the nursery (www.bluedoornursery.co.uk for anyone in the Seaford area, if you're interested...). My children have an absolute whale of a time. I love picking baby Aerin up at the end of the day to hear that she might have paint between her toes as she has been painting that day (stripped off to her nappy, how cute). In all honesty, while I love the idea of doing that myself at home, I know it would be a nightmare in reality, trying to keep the other children out and avoiding paint being tramped everywhere through the house.I love collecting no1 daughter to find her dressed as a princess, dancing around unobserved with the other children, in their own little world. And what is cute in my daughter was hysterically funny in no2 son, when I found him also dancing, but dressed in a purple princess outfit, which to me made him look like Princess Fiona from Shrek. I think I laughed until I cried.There are so many childcare options out there, from nannies, to nurseries and childminders. The important thing is to work out what you need from your childcare and then set about finding it.Childminders are great for a more individual service and most childminders can be flexible to some extent if you're running late because a train is delayed, or you're caught in traffic for example.My nursery is pretty flexible with being able to fit in extra sessions at short-ish notice. I think out of all the times that I've needed extra sessions there has only been one instance when they couldn't help me out which is really helpful. It's unlikely that a childminder could easily provide this flexibility as they're more restricted on numbers.Cost is obviously also an issue, with childminders generally being cheaper than a nursery. 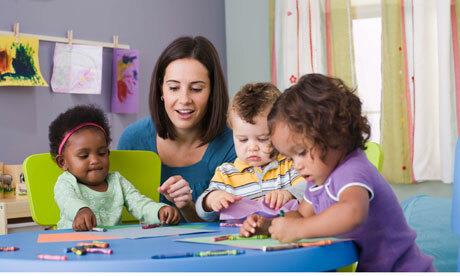 This can be off-set if your nursery accepts childcare vouchers which many companies provide their employees with as a tax-efficient element of their pay. Worth looking into. Some VERY forward thinking employers also provide nursery on-site, which is perfect as it saves you having to pay for travelling time.Whatever childcare option you decide on, remember if you're not happy or your child isn't happy, let them know. And if you don't get it resolved, change it. It's not worth the stress otherwise.